It's only relatively recently that conservationists have come to appreciate that efforts to protect mountain gorillas in the wild need to engage and involve the communities surrounding the habitat where this critically-endangered species lives. One notable example of this being put into practice is taking place in Uganda, where the screening of wildlife and great ape documentaries are helping to raise awareness of the importance of safeguarding gorillas and the forests they live in. To make this project come to life, The Gorilla Organization partnered with the Great Apes Film Initiative (GAFI) back in 2006. Then, in November 2010 the film screenings were given a fun and innovative twist thanks to the development of a pedal-powered cinema: an adapted bicycle that, when pedalled, produces enough power to screen films. This new idea means the films can reach and involve an even wider range of people from the community, not least among those people living in the Kisoro and Kabale Districts of Uganda, where the project began. "People are fascinated by the pedal-powered cinema and by what they learn from watching the films," says Aimee Long, Programmes Office at The Gorilla Organization. "The huge interest in the project shows that people really do want to get involved in gorilla conservation," she adds. Each session begins with the screening of a great ape documentary, with participants taking it in turns to pedal the bicycle that operates the cinema system. Following the film screening, participants take part ingroup discussions on what they have seen and how their understanding of gorillas and conservation has changed. Questionnaires relating to the documentaries, environmental awareness and ape conservation are distributed and are then used to assess the impact the films are having. This invention has also made it possible to reach communities lacking electricity and has therefore increased the number of people that have access to the great ape documentaries. "The project is vital because it targets those living closest to the gorillas in Uganda, those who have the power to protect or destroy the remaining populations of gorillas highlights Long, who has been part of The Gorilla Organization for five years. While participants have expressed their enjoyment at seeing the documentaries and powering the cinema using just a bike, the project has also helped to greatly increase the number of people actively supporting gorilla conservation efforts in central Africa. "Despite living alongside the gorillas, many people are not aware of their importance or the need to protect their habitat. Raising awareness of why we should conserve the remaining populations is therefore key to the survival of the last gorillas as it helps people to realise the negative effect human pressure can have", ", says Long. According to Long, the biggest achievement has been in the amount of people this project has reached including a wide range of people from farmers, school children to park rangers and members of the army. Despite that the plan was to target over 57,000 people in the first year, the demand was so great that this was far exceeded and over 68,000 people participated in screenings, she explains. 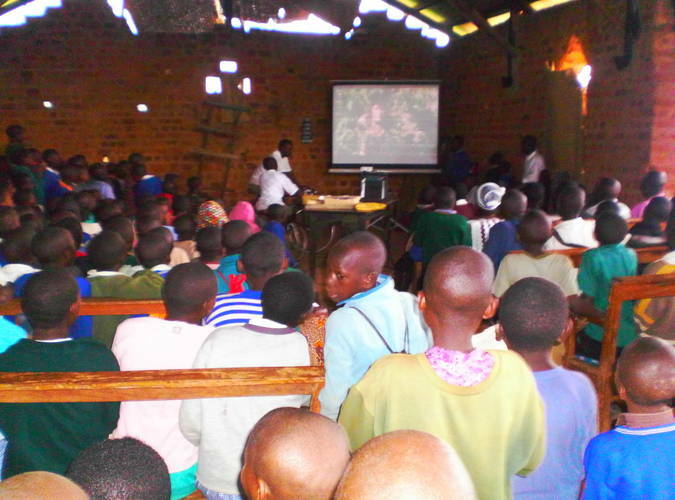 The latest report from May highlighted that during that month, film screenings were held in 11 schools in Kabale, western Uganda, reaching over 5,000 people, with plans now in place to extend the project into neighbouring DR Congo when it is safe to do so.